It’s confirmed: both Antarctica and Greenland are losing ice—around 350 billion tons each year—and, as a result, sea level has risen 11.1 millimeters worldwide since 1992. This photo shows a summertime channel created by the flow of melted ice, which ultimately carries the water away from the glacier to the sea. 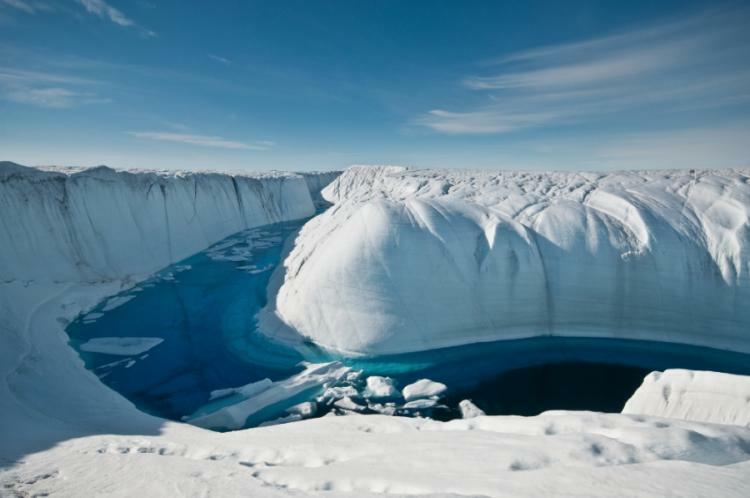 It’s not easy to measure melting ice. But by using data from 10 satellite missions, an international team of 47 scientists put together the most accurate estimate of ice melt to date. Ice melt doesn’t just affect sea level, however: the influx of fresh water could change the salinity of the North Atlantic enough to alter weather patterns in North America and affect ocean organisms.